What do Surgery, Art, Ethics, and MOLA have in common? I was studying for an upcoming biochemistry exam at the Harvard Medical School Countway Library when I first coined the term ‘surgical theatrics’. After hours of staring at lecture slides on glucose metabolism and the krebs cycle, my brain could not absorb any more information; clearly it was time to stretch and take a break. Stepping out of the main room, I stopped to admire several painting’s hung on the library walls. I found myself most intrigued by Joel Babb’s depiction of The First Kidney Transplantation — a grandiose piece that left me analyzing its details for more than thirty minutes. Little did I know, my “study break” would propel me into the world of art and medicine. Before studying medicine, I spent several years writing about theater in Chicago, participating in workshops and young adult councils at the Goodman and Steppenwolf Theaters, respectively. I learned to critique performance, fine tune my ability to hear beyond what was being said, and search for metaphor and meaning in the movement of each actor, the presentation of each costume, each prop, or instrument involved in the production. 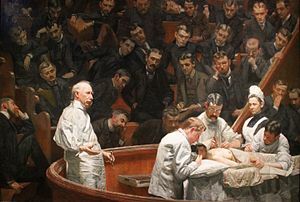 These skills allowed me to extract an inherent parallel between the fields of surgery and theater; an association that is not forced or construed, but rather very much apparent if we look at the origin of the surgical enterprise: the amphitheater. Although the terms “surgery” and “theatrics” are not novel — the conjunction between the two as “surgical theatrics” is. I invite you to read my recently published paper entitled, “The art of surgery: ‘surgical theatrics on the surgeon’s stage” to learn more about this topic and to see an example of published literature that combines my passion for the humanities, medicine, and improving patient care. Cynthia J. Ávila has been a MOLA member since 2017. She is a graduate from the University of Chicago with a degree in the History, Philosophy, and Social Studies of Science and Medicine, and is a recent recipient of the Advocate Illinois Masonic Hispanocare Scholarship. Currently, Cynthia is enrolled in the post-baccalaureate Health Careers Program at Harvard University and is a Visiting Scholar in Ethics and Medicine and the Hyde Park Institute.